(Nanowerk News) Call it "PAC-MAN, the Sequel." Scientists with NASA's Cassini mission have spotted a second feature shaped like the 1980s video game icon in the Saturn system, this time on the moon Tethys. The pattern appears in thermal data obtained by Cassini's composite infrared spectrometer, with warmer areas making up the PAC-MAN shape. "Finding a second PAC-MAN in the Saturn system tells us that the processes creating these 'PAC-MEN' are more widespread than previously thought," said Dr. Carly Howett, the lead author of a recently published paper in the journal Icarus. "The Saturn system — and even the Jupiter system — could turn out to be a veritable arcade of these characters," said Dr. Howett, research scientist in the Planetary Science Directorate of SwRI's Space Science and Engineering Division. The article, "PAC-MAN Returns: An Electron-Generated Thermal Anomaly on Tethys" appeared in Icarus. Scientists saw the first PAC-MAN thermal shape on the Saturnian moon Mimas in early 2010. They theorized that the shape occurs because high-energy electrons bombard the side of the moon that faces forward as it orbits around Saturn. As a result the altered surface does not heat as rapidly in the sunshine or cool down as quickly at night as the rest of the surface, similar to how a boardwalk feels cooler during the day but warmer at night than the nearby sand. "Studies at infrared wavelengths give us a tremendous amount of information about the processes that shape planets and moons," said Mike Flasar, the spectrometer's principal investigator at NASA's Goddard Space Flight Center in Greenbelt, Md. "A result like this underscores just how powerful these observations are." Finding another PAC-MAN not only confirms that high-energy electrons can dramatically alter the surface of an icy satellite, but it also shows that this alteration is dramatic enough that it is not cancelled out by the icy particles in Saturn's "E Ring" that continually blanket that part of the moon's surface. Scientists saw the new PAC-MAN on Tethys in data obtained on Sept. 14, 2011. The warmest temperature recorded was a chilly minus 300 degrees Fahrenheit (90 Kelvin), which is actually slightly cooler than the warmest temperature at Mimas (about minus 290 degrees Fahrenheit or 95 kelvin). 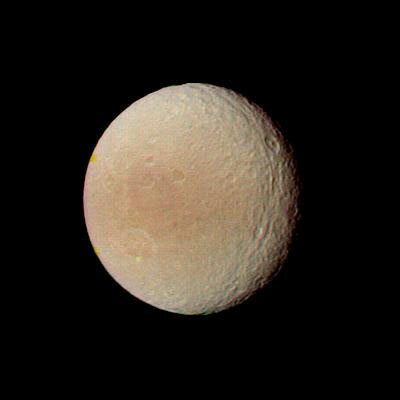 At Tethys, unlike Mimas, the pattern can also be subtly seen in visible-light images of the surface as a dark, lens-shaped region. This coloration variation was first noticed in a 1980 image of Tethys obtained by NASA's Voyager spacecraft in 1980. "Finding a new PAC-MAN demonstrates the diversity of processes at work in the Saturn system," said Linda Spilker, Cassini project scientist at NASA's Jet Propulsion Laboratory, Pasadena, Calif. "Future Cassini observations may reveal other new phenomena that will surprise us and help us better understand the evolution of moons in the Saturn system and beyond." The Cassini-Huygens mission is a cooperative project of NASA, the European Space Agency and the Italian Space Agency. The Jet Propulsion Laboratory, a division of the California Institute of Technology in Pasadena, manages the Cassini-Huygens mission for NASA's Science Mission Directorate, Washington. The Cassini orbiter was designed, developed and assembled at JPL. The CIRS team is based at NASA's Goddard Spaceflight Center in Greenbelt, Md,, where the instrument was built.